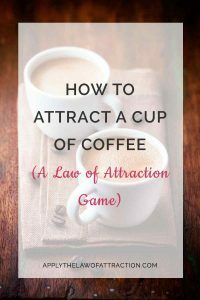 Today, I want to share with you a simple Law of Attraction exercise to attract a cup of coffee. 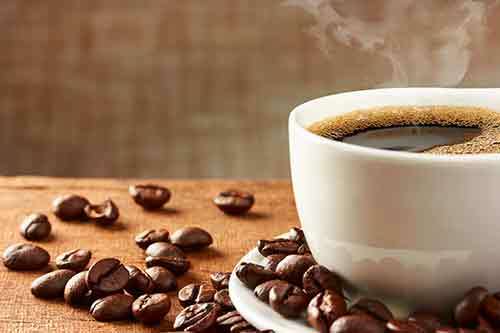 Why attract a cup of coffee? Because it's a fun game where you can learn how to manifest without expecting it to change your life or the world around you. With the pressure off, you can see how easy it is to make the Law of Attraction work, allowing you to create even bigger dreams more easily. I want you to play with this visualization and just have fun with it. Hopefully, if you're reading this you're familiar with the Law of Attraction. You know the importance of visualization and the power of your thoughts. You know the role your feelings play and how important expectation is. But how often has it worked for you? That's because when you really want something, if you can't see it in your reality, it's easy to doubt yourself and the Law of Attraction. Are you ready to attract a cup of coffee? According to Abraham-Hicks, it only takes 17 seconds of pure thought to manifest a desire. This won't take very long at all. You can come back and do it as often as you like, create as many cups of coffee as you want. As you share your successes with others here, it'll motivate them and help them to attract a cup of coffee too. So how do you attract a cup of coffee? If you already have a favorite Law of Attraction technique, or one that you've been wanting to try out, please use it. Sit and get comfortable, close your eyes, and take a deep breath. Hold out one of your hands and imagine someone has just placed a warm cup of coffee in it. How does the cup feel? Is it paper or ceramic? How heavy is it? Bring the coffee up to your nose and inhale deeply. How does it smell? Take a sip. How does it taste? When you are finished playing, open your eyes and say, “Thank you,” for having this wonderful cup of coffee…and go about your day. If you have a friend that you want to do this with, you can tell each other about your cup of coffee, describing it in as much detail as possible. Have fun with it like a child playing make-believe. You can also share all the details about your cup of coffee in the comments below. Once your cup of coffee manifests, let us know. Whether you see a picture of coffee or someone hands you a nice warm cup from Starbucks, come back and tell us about it. If you discover a new Law of Attraction technique that helps you in this game, let us know! The more successes that are shared, the more the power of the game will build, allowing even more coffee to manifest faster and faster. The prize for winning this game are cups of coffee and more confidence in your ability to use the Law of Attraction. There's room in this game for many winners. To win, all you have to do is play. Questions about the Attract a Cup of Coffee Game? Ask them in the comments below and I'll do my best to answer them. If you don't have questions, what are you waiting for? Start attracting a cup of coffee! I'm having fun already! Are you? So, I’m sitting in the business class lounge of a swanky airline and thinking that a nice cup of joe would hit the spot. The water’s great. The hummus was tasty. But, wouldn’t a warm, tasty bit of coffee with cream just hit the spot? Well, look up David, what’s that right there in front of you. Well, my mystical inner-voice, it looks like a coffee machine. Yes, David, once again you have manifested what you wanted. Go get-em Tiger! Tasty drinkin’s are on the way! I did it!!! I’ve had so much trouble manifesting lately, but I just got my cup of coffee! I used the visualization you listed. I could really smell the coffee. It tasted so good. About five minutes later, a co-worker comes by my desk with 2 cups of coffee. He brought one just for me because he thought I might like it. He’s usually an old grump who barely has a nice word for anyone, but he brought me a cup of coffee! It really works!!! I have the biggest grin on my face now! Thanks so much! On saturday night i asked for a cup of coffee by doing exactly what was instructed. Nothing happened. On Sunday….i was suddenly in mussoorie, the foothills of the Himalyas, droven by an expert driver, and experienced the most amazing cup of expresso coffee in the clouds, the rain and the fresh air of the hills. God really took care of the ambience before He fulfilled this coffee wish! This morning I woke up early to visit my friend I walked to the bus stop and I seen a girl drinking from a flask. It smelled like coffee, but am confused am I supposed to acquire the coffee for myself or see people with it. Because that’s what happened ? Congratulations on manifesting coffee! How you attract the coffee depends on how you’re trying to attract it. If you want to acquire the coffee for yourself, then that’s what you should focus on attracting. The less resistance you have, the faster you’ll receive it. Hi! First of all, I am from Brazil! Your posts are amazing and help me a lot! Thanks for sharing it! So… I tried this, but with a box of chocolate. I pictured it in my desk. I got a chocolate bar from a co worker. He gave it for all the girls at the office. Maybe should i had been more specific about the box? And could i get it from a specif person? Or sometimes the circumnstance can interfere in thr way things happen?! Hope you can read this. Thanks again. Are you sure the Law of Attraction was done? Did you stop focusing on the box of chocolate because you assumed you created the bar instead of the box? What if you had kept focusing on attracting the box of chocolate? What might have happened? Might you have received the box? You are right. So I am gonna keeep focusing on the box. I just tried it today and got the chocolate bar. Ok, so I tried this earlier today while at work. I really visualized it. At 5pm, a friend was walking past and stopped and said, “Want a cup of coffee?” I almost fell off my chair. When he came back, I told him about it. We are now both visualizing lobster! I seriously can’t believe this happened. I have never been happier to have coffee…..